Through simultaneous interpretation, individuals who speak different languages can enjoy the same presentation while hearing the speaker's words translated to their preferred language in real time. 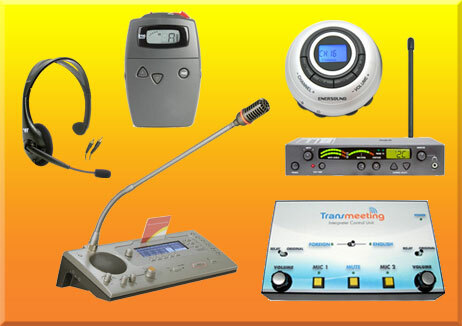 Thanks to the development of highly advanced simultaneous interpretation equipment this instant form of translation can be used in almost any setting for any number of different listeners and presenters. For many years our business has been working with almost every brand of simultaneous interpretation equipment in the market and thanks to this extensive experience and earned knowledge we can help you identify the best equipment for your needs at the best prices. When considering purchasing simultaneous interpretation equipment there are several questions you should answer ahead of time to help narrow down the best type of equipment for you. At its core, simultaneous translation consists of an interpreter who sits in a specially designed sound reduction booth and listens to the presenter speaking in their native language. The interpreter then uses a transmitter to send out their translated message to listeners who use a receiver and usually some type of headset to intercept and listen to the message. This translated message is sent out to the receivers via a specific channel that can either be transmitted using FM waves, or infrared technology. This ensures that no matter the type of environment or technology present in your venue where translation will take place a clear and reliable method of communication can be established. As the number of speakers or target languages increases the need for more devices and more advanced simultaneous translation equipment grows. If the original message is to be translated into more than one target language you may need more translation equipment including multi-channel receivers, and more than one translation booth. These multi-channel receivers will allow translations to be carried out for several different target languages, as well as enable two-way interpretation for back and forth communication, and also provide the opportunity to switch between channels if there is interference on a certain channel. A vital component of simultaneous interpretation equipment you may consider purchasing is a piece of translation equipment called an interpreter console (interpreter unit). This device acts as a control hub where the interpreter can adjust the tone and volume of the sound they hear as well control the output being sent to each channel. Allowing the translation equipment to output the best quality audio and switch between channels when necessary. More sophisticated interpreter units include a relay feature that allows interpreters to choose among audio sources (be it another interpreter in a foreign language or the main speaker). We offer the most professional-looking and sound-proof interpreter booths on the market. Our booths are either portable or full-sized. Our portable two-person simultaneous interpretation booths are easy to assemble and ideal for workshops and small meetings where space is limited. These booths are 4’ width x 2’ depth x 4’ height. Our full sized booths are sound proof and are compliant with all International Organization for Standardization (ISO) 4043 regulations for interpreting booths. These units are free-standing and self-contained and are designed to be both soundproof to prevent external noise from penetrating the booth, and are also designed for sound absorption to make sure that ambient noise within the room is absorbed and the translator’s words are clearly reverberated. These booths range from 5.25ft X 5.25ft (1, 60m X 1, 60m) to 5.25ft X 10.50ft (1, 60m X 3, 20m) depending upon how many interpreters will be in the booth at one time.